As a daycare provider to over one hundred kids, I have been potty training for fifteen years. Believe me, I know what works! Start the process with 5-ply underwear. They are able to absorb more, thus preventing puddles on the floor, but they still help the child recognize when they are wet. Pull-ups tend to keep children too dry and slow down the process of training. Have your child wear the cloth underwear while at home or close to a bathroom and keep the pull-ups for when you are out. Work into the fun “character” underwear when they have learned some bladder control. I tell the child that the person on their underwear doesn’t like to get wet and they need to try really, really hard to keep them dry. might be in a big hurry when they get to the toilet. If You're using a toilet ring rather than a potty chair, be sure to have a step stool available to assist them in getting on the toilet. Set a kitchen timer to go off every 15–30 minutes to signal to the child that it’s time to try again. In the beginning, they won’t know how to control their bladder and won’t be able to urinate on demand. When they do learn bladder control, extend the timer to 30 to 45 minutes. Always encourage them to let you know when they have to go even if they didn’t hear the timer. When you’ve reached 60 minutes on the kitchen timer, the child should be telling you they have to go and you can quit using the timer. Don’t ask a beginning trainer if they have to use the restroom. Tell them it’s time to go in and try. Have a book available for them to read. It could be a book on potty training that you read together while sitting on the toilet. In the beginning, the trainer needs to learn to relax their bladder, so reading a good book can relax them. Sometimes the sound of running water helps them learn to relax their bladder. Put the faucet on a soft trickle and let them listen. 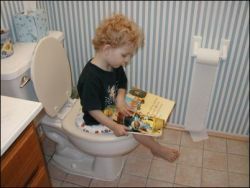 Boys can be messy on the toilet because they need to learn to direct the flow of urine. I prefer to potty train little boys by having them sit backwards on the toilet. (Facing the water tank.) This makes them naturally point down into the toilet and prevent spraying. You can buy fancy targets to put in the toilet to help little boys with their aim, but a box of Cheerios is a lot cheaper and works great. Throw in 5 or 6 Cheerios each time they use the toilet. By the time they finish a box, they shouldn't need a target anymore! control, these first trips to the bathroom may include sitting for a long, long, long time with nothing accomplished. Even if your child doesn’t manage to empty their bladder on those first trips, thank them for trying. Keeping things positive during potty training is important. calling me from her cell phone to tell me that she was going to be late. The reason was that her daughter was just starting to potty train. They had made many trips to the bathroom with no success in actually going. So this mother was determined to sit in the bathroom with her daughter however long it took for her to get the job done for the first time. It took over two hours of mom sitting on the bathroom floor! The good news was that after this episode, her daughter knew what she was supposed to do on a trip to the bathroom and things progressed quickly from then on. There are signs your child will show you to let you know they have to go to the bathroom, but they might not recognize the signal themselves. They may place a hand in their private parts, bounce up and down, cross their legs or go hide in a corner. Watch for these signs and then tell them it’s time to go use the bathroom. Don’t ask, tell. During the first couple weeks of potty training, expect accidents. It does not matter if you are raising a genius or not, THERE WILL BE ACCIDENTS. Since you’re going to expect accidents, you should not get angry when your child pees on your carpet or your floor. Have cleaning supplies ready to clean it up appropriately, but do not get angry. If anger enters the equation, complete potty training will be delayed. Do not make your child clean up their own accidents. Number one, they did not have the accident on purpose. Number two, they are not capable of cleaning up this type of mess the way you know it needs to be. Here are a few other hints to help you through your potty training journey. When you are running errands or going on a long road trip and you might not have immediate access to a bathroom, use pull-ups. Also, if your child can’t make it through the night, use pull-ups. Night time training will come in its own time. before nap, just before bedtime and just before you get in the car to go anyplace. their bladder when you ask them to. A phone call to Mom or Dad if they are in daycare, or a phone call to a grandparent is exciting for a trainer and reward them appropriately. If you let your child get into the habit of getting a drink of water before they go to sleep or getting up in the night and needing a drink of water, it will be hard to break them of this habit when they are trying to potty train. If it sounds too good to be true... it probably is. Don’t fall for the gimmicks that promise they can help you potty train your toddler or preschooler in a day or a week. I have potty trained many, many children and tried all different approaches and I can honestly tell you, it won’t happen in a day. Complete potty training takes anywhere from three to nine months. Reward your child's success, but do it reasonably. Some children are satisfied receiving stickers on a chart, but with others it will take something a little more substantial. Avoid rewarding with food to eliminate starting a bad habit. Also avoid rewarding a child for every single time they go on the potty. Reward them for reaching goals. For instance, start by rewarding dry pants for a half of day. Then after a week or two, reward for dry pants all day. After another week or two, reward for dry pants all week. After another few weeks, let the rewards subside. It just becomes expected behavior. Do you have a success story you'd like to share? We'd like to hear what worked for you so we can share it with other parents who are on the potty training journey!